There are any number of reasons you might want to make a vegan birthday cake – perhaps your family is vegan or maybe it’s just one of the guests at the party who doesn’t eat any meat or meat by-products. However, if you’re not used to vegan baking, it’s a good idea to have a couple of trial runs before launching into making a cake for a special occasion as there are plenty of things that can go wrong and the techniques you need to use are quite different to those used when making cakes that use eggs as binding and raising agents. The first thing to understand is that making a good dairy-free and egg free sponge only seems difficult if you approach it as you would a egg-based cake. An egg in a cake recipe is used to bind the other ingredients together – quite a few alternatives can be used, to replace the egg, but because they have different properties you need to pick the right one for your purposes. Cocoa butter, carob and bananas will all make the cake rich and substantial but at the cost of some height, while agar, locust bean gum, vegetarian gelatine and vegan egg replacer will all make the cake lighter, but possible also inclined to crumble. 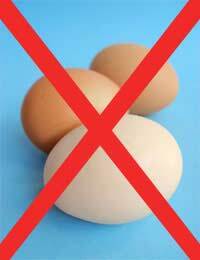 Possibly the best egg replacement ingredient is silken tofu which can be purchased in many health food shops. Second you need to understand how to get a vegan cake to rise. The secret is to blend the wet ingredients thoroughly before folding in the dry ingredients very gently – this stops you losing any air from the mixture and keeps the ingredients light. Use the best quality soya margarine you can find, and, if you are converting a traditional recipe, add an extra teaspoon of baking powder to leaven the ingredients. Good vegan cookery doesn’t come from adapting recipes, so much as learning new ways of cooking that make the best of ingredients that are just as good as traditional ones when properly utilised. The recipes below offer several alternatives. Heat oven to 180 C and grease two square baking tins. Dissolve the soya margarine and sugar in a small pan over a low heat and allow to cool. In a large bowl sieve together the dry ingredients. Over a low heat dissolve margarine and sugar. Allow to cool. In separate bowl mix together dry ingredients. Add the cooled margarine mixture to the dry ingredients and mix well. Add the soya custard – you are aiming for a soft dropping consistency (the cake should fall from a wooden spoon if tapped on the side of the bowl) so if it seems too dry, add a little soya milk. Divide between the baking tins and level the surface before baking for 25-35 minutes or until a skewer inserted in the middle of the cake comes out clean. Leave to cool in tins for five minutes before turning out onto a wire tray to cool completely. When entirely cold, sandwich the two cakes together with icing made with from vegan margarine and icing sugar beaten together and cover with fondant icing. Beat together the bananas, vanilla essence, oil, sugar and water. Sieve together the flour, cocoa or carob and baking powder. Combine the two gently so as not to knock the incorporated air out of the wet mixture. Divide between the two tins, level the surface of the mixture and bake for around 40 minutes or until a skewer inserted into the middle of the cake comes out clean. Cool this cake in the tins. When it is cold, sandwich the two cakes together with butter icing as above, with a good dash of maple syrup.